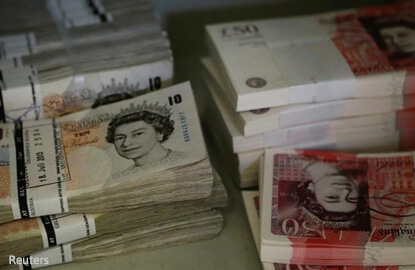 LONDON (March 2): Sterling slipped to a six-week low against the dollar on Thursday after data painted a mixed picture of Britain's economic outlook, with the construction industry picking up slightly in February but new orders slowing. Data also showed growth in housebuilding cooled to a six-month low and commercial construction activity contracted for the first time in four months, though this was outweighed by an improvement across civil engineering firms. They followed weaker-than-expected figures from the manufacturing sector on Wednesday, and data suggesting Britain's economy will slow after defying the shock of last year's Brexit vote, with consumers turning more cautious about borrowing. Uncertainty over the prospects for Britain's economy as it breaks away from its main trading partner has wiped off almost a fifth of sterling's value against the dollar, and traders say developments around Britain's departure from the bloc will continue to be the main driver for the pound. Prime Minister Theresa May suffered a defeat in Britain's upper house of parliament on Wednesday, with members voting for a change to her Brexit plan that says she can only trigger divorce talks if she promises to protect EU citizens' rights. The vote was a blow to May, who had hoped to pass her Brexit bill without changes, and it will push back the earliest date she can formally launch the process of Britain's departure from the EU to around March 13. But it had no discernable impact on sterling. "If she can trigger Brexit as per her deadline, it may push sterling even lower as this will send the message that Theresa May is in full control and her hard Brexit is taking shape," said Think Markets market analyst Naeem Aslam, suggesting a level of US$1.18 for the pound in that scenario. "On the flip side, if she cannot deliver this on time, this could be a positive thing for sterling, and the currency could rally all the way to US$1.28, with a potential target of US$1.30 a realistic target as well." Sterling slipped a quarter of a percent on Thursday to US$1.2259 against a broadly stronger dollar, having traded at around US$1.2280 before the construction data. Against the euro, the pound hit a two-week low of 85.90 pence. "We expect euro/sterling to move even higher in coming months, ahead of and after the triggering of Article 50," wrote currency strategists from Danske bank, who have 87 pence per euro as their three-month projection. "That said, euro/sterling is not only affected by political uncertainty in the UK but also in Europe, not least due to the French presidential election, which may put downward pressure on euro/sterling if Marine Le Pen gains momentum in polls."